It has 2 buttons OK and Cancel. We can put any name in place of "OK" or "Cancel". Ok... So here is the simple code for this. self.alert = [[UIAlertView alloc]initWithTitle:@"Signup Alert"
message:@"We will redirect to our site. where you can signup through your details. 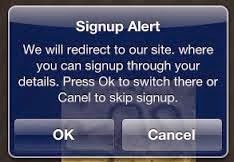 Press Ok to switch there or Canel to skip signup." 3. Now if you have declared delegate to self then write the below function, which will be called automatically.